Angela and stacked bamboo tunnels. Angela inspects and chews stacked bamboo tunnel. Angela peaks out from bamboo tunnel. Salad and live herbs on the glass table for degu grazing pleasure. Under the Glass Table and Cage. 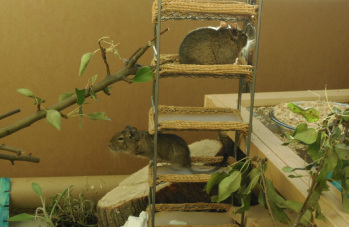 The Degus decided to build a Nest under the Cage. Pamela Poses under the Glass Table and Cage. Excuse me, I'm trying to have a bath! Ohhh, please, please may I have a treat? Please? Nyumm nyumm nyumm nyummm nyumm! cowslip). On the right is a pile of fresh organic lettuce leaves with various types of lettuce; it is refreshed a few times each day. The tube on the glass table is a bamboo tunnel, and the frame around the glass table is made of pine. I bought the pine from the local hardware store and cut it to put together the frame so the girls would not slide off the sides of the glass table -- and they can chew the frame, too. The legs of the table were originally plastic, but I replaced them with logs from our yard and connected them to the table with double-ended screws purchased also from the hardware store. 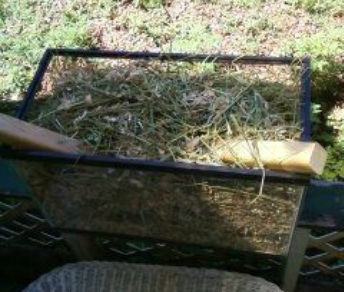 The plants in the enclosure are organic live herbs purchased from the local grocery store: basil, sage, and rosemary. cardboard on each level for the comfort of Pamela and Angela and it turned out to be perfect to support branches. Here Pamela is napping on a log that was from a cut-down untreated tree in our yard, and Angela is napping at the top level of the support structure. Here Angela has awoken and is on the branch structure looking for some leaves to chew. Here is a view of the structure with a tuft of wild untreated grass seeds in the foreground and another tuft on the log. 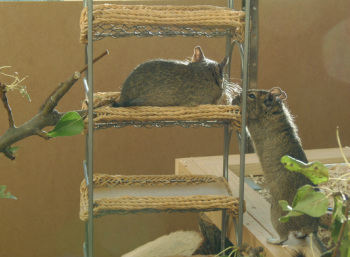 Shortly after this picture was taken, Pamela and Angela spirited away the grass seeds into their nest under their cage (their cage is always open into the rest of the room which is surrounded by a playpen permanently set up to protect Pamela and Angela in their degu-proof room). Pamela is just barely visible in the bottom left side of the picture in the open dust bath, and Angela is just barely visible on the log behind a branch. 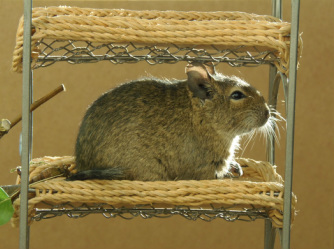 Here are two pictures of Pamela on the floor of their enclosure with a degu-view of the branch structure. And here is Angela climbing around the bottom part of the branch structure chewing on a branch (the red specks on the floor are rose petals; I sprinkle flowers throughout their enclosure so they can have fun foraging as they would in the wild).